In keeping with our heavy diet of ROAD INFO, we’ll continue with a quick stop in the great state of GEORGIA! We rolled through Atlanta for a little less than a week, and while our schedule was too crazy to get any video, we did spend some museum time one day, (the Georgia Aquarium, which is truly jaw-dropping) and what’s gotta be the best many-millions ‘o dollars marketing pitch of all time, theWorld of Coca-Cola, or the Coke museum. Wow. But the best part of the whole day was our introduction to theMellow Mushroom Pizza chain! Mellow Mushroom started in Atlanta, specializing, in their words, in “the two food groups known as pizza and beer”. The pizza was - in a word - mind-blowing (a hyphenated word, but whatever). They are franchising now, and our spies tell us that they make a special effort to feature LOCAL BREWS in each of their restaurants. Go Mellow Mushroom! We’ll be back, and we’ll be ordering whatever’s local. In this case it was several brews from Atlanta’s ownSweetwater Brewing Company - we loved their Georgia Brown Ale, of course their IPA, and were struck by the fruityness and rewarding finish of the ‘Motorboat’ ESB. 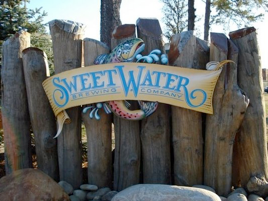 Keep an eye out for these brews, AND the Mellow Mushroom!